PLEASE SUPPORT THE 2017 ANNUAL P.B.A TOY DRIVE!! The Township of Washington Police Department is happy to be a part of the 2017 Annual P.B.A Toy Drive! The Township of Washington Police Department believes in giving back to our community! 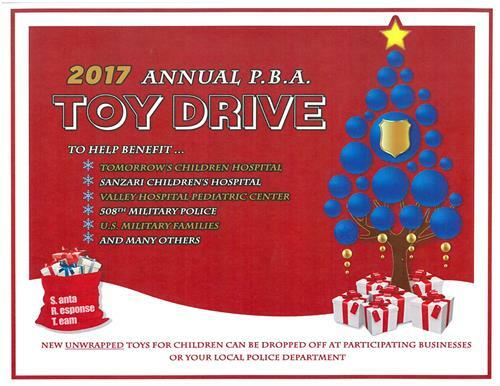 One of the ways our department gets involved is being a part of the 2017 Annual P.B.A Toy Drive. We are collecting new unwrapped gifts for organizations such as Tomorrows Children Hospital, Sanzari Children’s Hospital, Valley Hospital Pediatric Center, 508th Military Police, U.S. Military Families and many others organizations as well. If you are able to contribute please drop off any new unwrapped gifts to the Township of Washington Police Headquarters, located at 350 Hudson Avenue, Township of Washington New Jersey. Our department is open 24 hours a day, 7 days a week so someone will be here to collect all toys and donations! The deadline for receiving toys is December 17, 2017. The Township of Washington Police Department greatly appreciates your generosity during this Holiday Season! The Township of Washington would like to wish everyone a Happy and Safe Holiday Season!